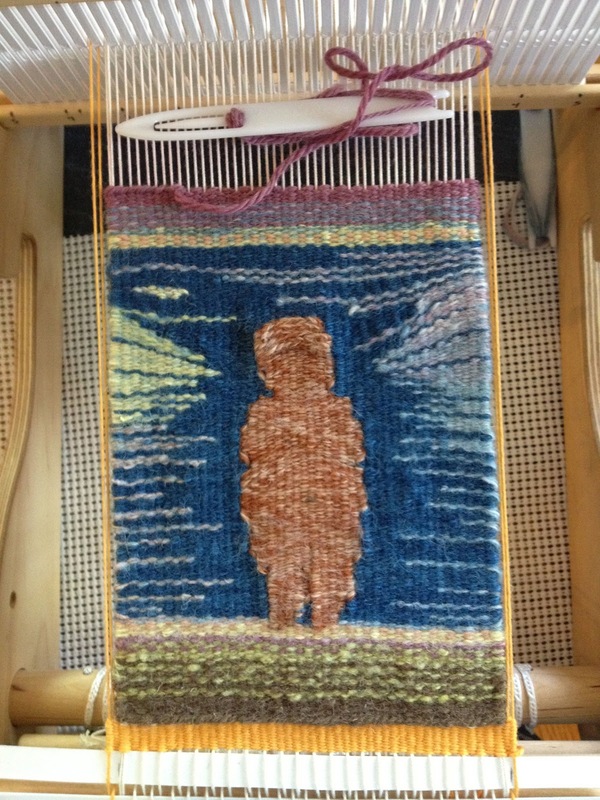 I have a group of friends, Goddesses really, that are amazing weavers and spinners but some of them have not done much tapestry weaving and they have asked me to work up an introductory project for them. My friend Gina( biologist and natural dyer extraordinaire) helped me turn some of my handspun into a palette of colors from indigo, cochineal,pomegranate, logwood, madder, onion skins and various other plant materials.. Thank you Gina! My first decision was to work from these colors for the sample. 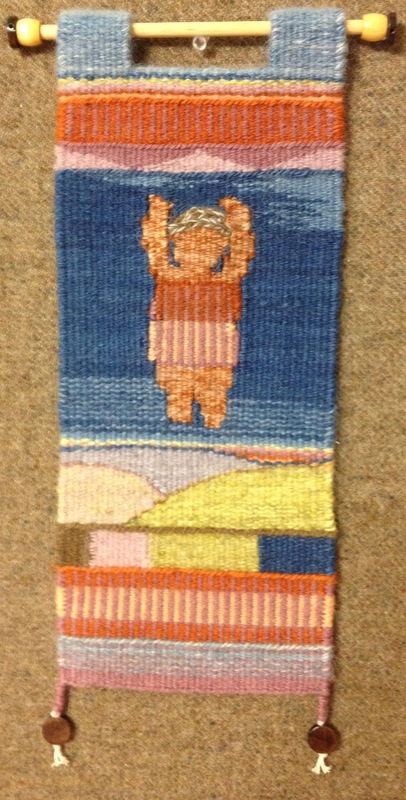 I like to work with my handspun yarns for tapestry although I am willing to use just about anything that works for me. The yarns in the background of the blog are primarily handspun by the way and that sounds like a future post, Spinning Yarns for Tapestry Weaving. Later. 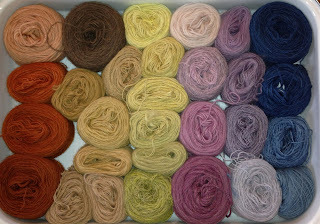 I have included a picture of the handspun, naturally dyed palette. The objective was to design a sampler that would introduce some tapestry techniques and then use some of them for a Goddess symbol also in the sampler. 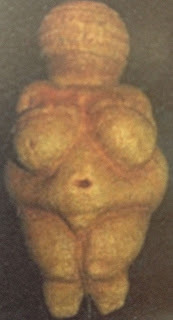 I decided to take some inspiration from an artifact Goddess or Venus of Willendorf and here is an example from Wikapedia. It seemed like a good idea to have the Goddess figure throwing her arms up in the air and my working title became, Goddess Rising. 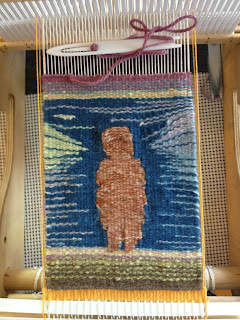 I warped my Big Sister Mirrix Loom with 12/9 cotton seine at 8 tpi , made a few sketches and plunged right in. 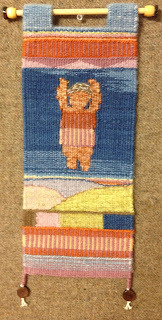 Once the sampler was complete it seemed that Goddess Rising felt more like Goddess, Day at the Beach Playing in the Surf. As one of my friends reminds me though Goddesses need to have some fun too and that did seem appropriate for this group! In an effort to make this project as accessible as possible I decided to try a further sample on a rigid heddle loom. I really enjoy my rigid heddle looms for many things but the obvious problem for tapestry weaving is that they are not really designed to hold the kind of tight warp that is so advantageous for tapestry. Nevertheless the experiment continues. For this sample I decided to return to the earthier Goddess idea. Obviously it is possible to weave tapestry on a rigid heddle loom but it is not favorable for me! I really missed the crisp feeling and satisfying beat that I get on my Mirrix Looms and will be happy to return to them now. So the Goddess project continues with the next in line to work up an introductory sampler fit for a Goddess that does not actually contain one. Then handouts, oh my! They are both marvelous and goddess-y. I can't wait to experience the results of your efforts. Love your site. Very lively and inspirational.